Carter Aldrete arrived in Chicago for one of the biggest weekends of his life, ready to fully embrace the opportunity at hand. He takes a look at the big city landscape around him, focused as he participates in the player’s workout at the University of Illinois at Chicago. He smiles when sitting in the players lounge on the sixth floor of the Lake Shore W with some of the most talented players in the country, soaking in the privilege and opportunity that was placed on him with the invitation to the nation’s premier baseball showcase. The experience is something that Aldrete doesn’t take for granted, that’s because he’s part of a family bloodline that had expectations that come with being a talented baseball player. His father, Rich, was an All-American himself at Cal and played five years in the San Francisco Giants organization in the late 80’s and early 90’s. Carter’s uncle, former outfielder Mike Aldrete, played 10 seasons and 930 major league games with the Giants and Oakland Athletics among other ball clubs from 1986 to 1996 and is the current bench coach for the A’s. A lot can be learned with such vast knowledge of the game just a phone call away to Uncle Mike or a conversation at the dining room table in the Aldrete family home. Appreciating each opportunity is most important to him. At 17 years-old, Carter has gained important lessons having been around the game as much as he has with family who themselves are still involved in the game. Aldrete hasn’t taken his opportunity for granted. A three-sport athlete at Monterey High School in Monterey, California, Carter decided to stick with baseball, determined to focus on certain aspects of his game to get to the next level. 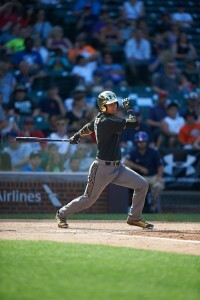 Carter showed great potential back in July 2013, participating in the Under Armour Southwest Championships and then again in 2014, this time as a sophomore where scouts loved his skills defensively; a sure-handed short stop with soft hands and a plus arm. 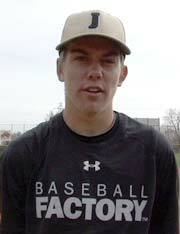 Both events prepared him for an opportunity at the 2015 Under Armour Pre-Season All-America Tournament, a pre-cursor to being selected to this year’s Under Armour All-America Game at Wrigley Field. At the Pre-Season All-America event, Aldrete play solidified himself as an all-around talent with skills that would play at the next level. 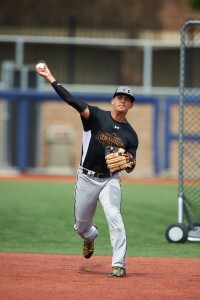 Carter’s ability to hit, field and throw at his position at shortstop led him to being one of the premier talents at this year’s All-America Game. Despite the national level of exposure with this game, the lights were never too bright and the stage never too big for Aldrete’s talents to shine through and be prepared for the moment. With his education still a priority, Aldrete has committed to Arizona State University where he’ll play in 2016 for heralded head coach Tracy Smith, twice the Big Ten Coach of the Year with the Indiana Hoosiers. It was a matter of comfort and an easy decision based upon very simple factors. The talk then turns to Carter Aldrete, the person off the field. His talent isn’t limited to the baseball field; he enjoys things any normal 17 year-old enjoys like shooting hoops, going to the beach and spending time with friends and family. All of that and one thing not usually reserved for most 17 year-olds. “I love to cut hair. I cut my own hair, I even cut my buddies hair,” Aldrete says with a laugh. He smiles, nods and doesn’t exactly say no when asked if he’ll open his own barber shop one day. Cutting hair. Playing baseball. The sky is the limit for Carter Aldrete. In a family of baseball players, Carter’s sister, Annie is blazing her own path as a highly-talented Softball player, transferring from Tennessee to the University of California for the 2016 season. Despite the two different sports, the support stays strong between the siblings. It’s well past 11:00 P.M., hours after the eighth annual All-America Game ends. Carter sits in the room where his teammates have made a lifetime of memories in three days as the night begins to wind down. He’ll hop a flight and head back to California in the next few days, ready for the next part of his journey to start.